It’s a good thing most of the movies about us are absolute crap and no one watches them. What if someone took everything awful about Fight Club (the machismo and misogyny, the too-easy political nihilism, the cliche masochistic bromance) and mixed it with everything awful about SLC Punk (the oversimplification of anarchism, the obvious fact that youth doesn’t last, the yay-for-selling-out ending), amplified it, and turned it into a movie? 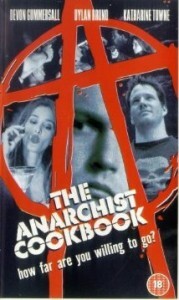 You’d have The Anarchist Cookbook. The Anarchist Cookbook is the worst movie about anarchists that has ever been made. Some movies misunderstand us (SLC Punk). Some movies vilify us (El Bosc). Some movies condescend to us (The East, No God, No Master). This movie intentionally warps our words and practices, alternately mocking us and reviling us.